We’ve all heard statements like this. Perhaps we’ve been guilty ourselves of spouting our hatred and frustration towards those tasked with keeping order in athletics. There is perhaps no job more universally hated than that of the referee; on par with lawyers, IRS tax auditors, dentists, and telemarketers. Referees are placed in a position where no matter what they do they will never make anyone happy, and more often than not end up as the scapegoat when one team isn’t playing well. While their lack of vision and intelligence are often mercilessly attacked, those who wear the stripes spend a great deal of time and effort to be the ones governing athletic events, and are quite skilled at the difficult job tasked to them. What is it that they are actually looking for that decides when to throw a flag, what preparations do they go through to get on the field, what is their mindset during games? Are they actually blind, taking bribes from coaches, or have money riding on the game as they are often accused of doing? I wanted to find out these details and more directly from the referee perspective, so I spoke with a longtime college football official, a 17-year veteran on the division-1 level in both the Pac-10 and the WAC as a line judge. They asked to remain anonymous in exchange for their honest and candid answers, which hopefully will help us all think twice before immediately assuming that the refs have a personal vendetta against OUR team. And yes, this official has worked Oregon games before, and has emphasized to me repeatedly how LOUD Duck fans are at Autzen Stadium. People who are interested start by attending classes, there are various football associations broken into individual units by region that will host these courses for those interested in becoming an official. The associations are regulated and there are particular qualification standards and tests taken that must be passed in order to become an official. Normally everyone starts in high school football or pop warner and lower divisions, then graduate up to junior colleges working your way up to division-1. As you cut your teeth people can start putting in applications to the various leagues. 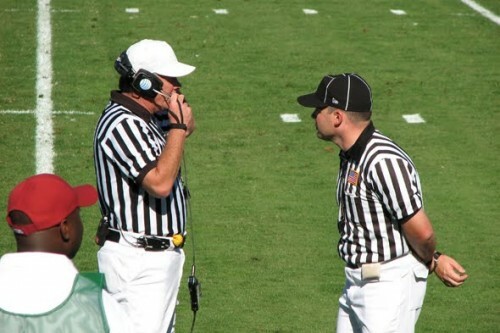 There are also football officiating camps all over the country to attend to sharpen your skills and knowledge, they are very popular for those who want to improve their skills and move up. They are usually run by officials with lots of experience, and often NFL officials too, and college supervisors will be there as well to gather information on potential officials to hire. Every year they have new rules and proposals for rules, sometimes they want our input on it because as new rules are implemented they can be difficult to officiate. Around mid-March we get a list of new rules that will go into effect for the upcoming season, after that we know what to start studying. We have spring study clinics where we meet to go over new rules and existing rules. We’ll get study questions from our supervisors, they aren’t true/false questions but situational questions we have to answer typical of in-game scenarios. Each conference has a yearly clinic to go over rules, take a test that we must pass, and go out into a field to work on our positional skills to help us be better officials. Q: Why would someone want to be a referee? You have to maintain order, yet at any given moment you may be the most hated person on the field with coaches, players, and fans sometimes wanting to kill you? The gameday atmosphere is special. It’s such a rewarding experience that I really enjoy, I still enjoy seeing the fans coming in and the teams warming up and having that same exhilarating sense of anticipation that everyone else gets before kickoff. I always remind myself that there are hundreds of guys who wish they could be here right now in my position to take in this experience. Q: How do you prepare for the season physically? I start working out earlier in the year, as I’m getting to the end of my career it takes longer for me to get into shape for the physical toll a game takes. You really have to be in shape to run up and down the field, because when you’re tired just like any athlete that’s when you tend to make mistakes. We need to make sure that we’re in good shape to keep up, because when you get tired you may not be in the right position to make the proper call. There are times to take breathers between plays, but we still need to be vigilant because coaches are asking questions, or we’re telling them to keep the sidelines clear. Q: It seems like some coaches actually stand out on the field during the game. Why are flags rarely thrown when they do? The sidelines are where we work, so it’s important as a safety issue that coaches and players stay back, especially on a change of possession usually we’re backpedaling down the sideline. That’s when some officials can get hurt because we’re looking at the play not where we’re going and we may run into a coach or player that just want to get a better look at the play. Every team has a “get back coach” whose job it is to keep their guys back off the area where we have to work. We tell them to get back rather than flag them immediately, we try not to throw flags all over the place but to talk to them reminding them that it’s a safety issue. Some of them don’t’ really realize that they’re out on the field because they’re so involved in the game emotionally they don’t realize they’re doing it. Q: What about coaches who tend to scream a lot at you? As an official we have to remember that it is really an emotional game, and sometimes coaches can get wired and so heavily invested in what’s taking place that they don’t see the officials, or say things they regret…I’ve had coaches come up and apologize to me after games because they were so into it at the time they regret what they did, and we have to remain unattached and can’t be emotionally involved in the game. We’ll have everyone hollering at us, but we have to stay calm and communicate properly. Sometimes they just need the details of what happened, because maybe they can use it as a teaching tool for their players. Regardless of what it is, if a coach asks for information we don’t ignore that, we give it to them, but also explain that it may take a couple plays to find out the details. If it was another official that made a call it may take until there is a break in action to find out what the call was and report back. 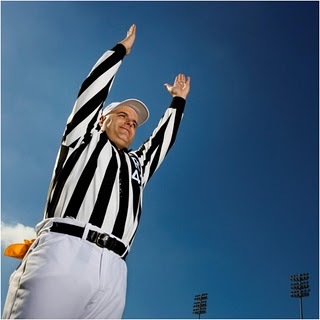 We never ignore the request, because they’ll appreciate it when you provide them with the details, it may not be timely because you can’t stop the game just to ask “what did #69 do to get the personal foul flag called on him?” But we do our best to provide information when it is requested. There have been times when I may have missed a call, or called something that was minor, and had coaches that were on me on every single play because of it. You just have to keep focus on your job, keep officiating. Sometimes it can be difficult to ignore, but if you respond it will only add fuel to their fire. You can’t let the coach get in your head because then you’ll be ruined for that game, they may rant and rave but as long as they don’t say anything about my heritage or family then I’ll let it slide. If they take it out of the realm of football officiating then it’s gone to the next step and it may be a foul, but if they’re ranting just about a call then let them rant all they want. Once they get under your skin then they know you may make more mistakes, just keep focus on the game you have to officiate. Q: These days the game is so fast, and you’re expected to keep a close eye on every detail as it goes by in the blink of an eye. How do you keep track of it all? Focus. You try to do your job. You’re not a spectator, you can’t watch the game like a fan. Every official has an area of the field to focus on, and you have to just focus intently on your area, concentrate on your job. As a line judge, I’m watching the snap, the tackle, and the designated receiver for me, which is usually the back coming out of the backfield. Keep track of your area of responsibility, as each official has a receiver that they watch. If they’re entrenched on my side my receiver is the second receiver from my sideline, and I have to know on every play what happens to him. Every play I am watching the snap, the tackle, and on pass plays the back out of the backfield concentrating to see if they are fouled. Every official has a checklist. My checklist starts with the beginning of the play knowing the down and distance, as that often tells me what kind of play it may be, run or a pass, and I can prepare for it. Next I need to know the clock situation, is it running or is it stopped. Then I think Snap-Tackle-Back, where I’m watching the snap of the ball, then the tackle and my receiver. Then after the play is over we have to be a good dead-ball official, making sure nobody is hitting late taking cheap shots. Because one late hit can lead to retaliation, we want to make sure we catch that or we’re going to have a long game, especially in rivalry games. Once the play is over we’re immediately looking around making sure we focus on that trying to avoid anything after the whistle. Q: The game has changed a lot in recent years, instant replay and HD cameras and stadiums with replay screens…before referees were the final authority on everything, now every play gets reviewed, and in the pros if coaches don’t like it they can throw a challenge flag. With HD super slo-mo on the big screen people forget that you have to watch the play in real time and instantly make a judgment on it. Does it add pressure knowing that the cameras may prove you missed something, and do you ever find yourself glancing at the replay screen? No, I don’t, because I don’t want the coach seeing me catching a glance because he’d never let me forget about it for the rest of the game. Coaches may be screaming at me “he was in bounds! Look at the big board, he was in!” And the minute I take a look and he sees me glancing and I see that my call was opposite of that then I have a problem. Fortunately we have instant replay, and in college every single play gets reviewed by the official upstairs, so if there is a question it gets buzzed down for another look. I haven’t yet spoken to an official that has a problem with replay, sometimes the play happens so fast that we appreciate that it is there if we’re not sure. We need help sometimes, sometimes we don’t know because we didn’t see it, so having replay is good because our ultimate goal always is to make sure that we get the call right. Sometimes we just can’t see what happened because of other players around. Q: Does crowd noise ever affect you in the course of a play or being able to communicate with the other officials? Sometimes the crowd can hinder communication between officials, and sometimes we have to use hand signals if we can’t talk directly. I try to remind myself that I have to concentrate on the next play, regardless of what they may be yelling my job is to just concentrate on the next play and go through my checklist. In some stadiums where the crowd is really close to the field you can certainly hear them, but the one thing you don’t want to do is acknowledge that you can hear them. They’re fans, that’s their opinion, they may be right but hopefully not, and you have to be ready for the next play, because if you acknowledge them then they know that they’ve got you. Q: It is said that there is holding on nearly every single play of a game, or every pass could be considered pass interference, and it’s a matter of degree that determines whether or not you throw a flag. 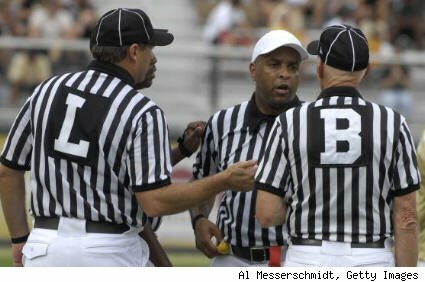 Do you ever have to look at the bigger picture of the game to determine if you throw a flag or not? Sometimes it depends on the time of the game and the score. Let’s say it’s nearing the end of the game and it’s 35-7, you probably want to just keep the game going at that point. We are graded on all of our calls and non-calls, and we’ll have a little foul sheet that we fill out, and sometimes we may state “there was a holding call in the 4th quarter at 2:45 in the game and I ignored it,” and the supervisors will recognize that and understand why you let it go. The important thing is to write it up and present it and explain why a flag was not thrown. If it’s a close game though we need to throw a flag. The important thing to remember is if the foul had an effect on the play. If it’s a hold that springs the play, we need to throw a flag. Did the foul have an impact on the play? If so, then that’s the call you want to make. Sometimes we may use terms like “there wasn’t enough restriction,” meaning a block didn’t have enough to require a flag. The coaches may disagree, but I’ll say “Yes, coach, there was a hold, but there just wasn’t enough there to make that call.” That at least lets the coaches know that I did see it, some coaches will accept that and some won’t. The person we have to please the most is our supervisor, as long as he is happy with our call/no-call then I don’t have a problem with what the coaches may think of a call. If it’s a bang-bang play we usually let it go, particularly on pass interference. Sometimes it is so close where a defender gets there right before the ball does, but your eyes can’t see it that closely, so you are better off just letting them go. If it’s obvious they got there before then yes throw the flag, but if it’s so close it’s better off just not calling it. We look for restriction and “the turn.” Just because somebody has a hand on the receiver doesn’t mean automatically it’s a flag, but if the hand causes them to turn the receiver, then there’s a foul. We call it “the hook & turn,” if it’s just a hand then it’s not a foul, but if the defender hooked him and caused a change in direction then it’s a flag. If there’s intention to impede in some way it’s a flag, if it seems like it was unintentional like tangled feet or if the defender looks back for the ball then we will often let it go. Q: Sometimes there are gray areas in the rule book where it doesn’t define what the refs should do in response to a potential infraction. For example, Oregon has had an issue of teams supposedly faking injuries against them to slow down the offense. When it isn’t defined what you should do as an official when it seems like teams are taking advantage of something in the rule book that is shady, what can you do? We call it the 3-4-3 rule. If the ref feels like a team is taking advantage of the timing rules to their advantage in some way, they can use that to start or stop the clock to prevent that from happening again. The rule is there for that reason, that if somebody is taking advantage of the timing rules, the officials can adjust the clock in whatever fashion they feel is fair. It’s hard to judge as far as injuries because we aren’t medical staff, if a kid falls down and says he’s hurt we’ll take a timeout and give them the benefit of the doubt. But if a coach is yelling “Johnny, Johnny, fall down!” and we hear it, now we’ve got something and we can do something about that. If we hear that a coach is telling a player to intentionally fake an injury just to get a timeout, then we can call unsportsmanlike conduct. But if a defensive back all of a sudden just falls down, all we can do is stop the clock and assume they are injured, we don’t know if maybe they have a concussion or potentially having a problem, so we’ll stop the clock and let the medical staff take care of them. There’s really not anything we can do unless the rules committee changes it, and there’s nothing in the new rules that talks about faking injuries. It is mentioned in the ethics section of the rule book as something unethical that teams shouldn’t do, but it isn’t really addressed how we officiate it if teams are trying to take advantage in some way. Q: Are there ever times when something unusual happens and you’re not sure what to call? There have been times definitely, fortunately we have an advantage where we can huddle and find out. Sometimes the coaches ask what just happened, and I can meet up with the referee, find out, and report back. Occasionally we do have delays where we’re not exactly sure what just happened and we have to figure it out. It’s good if you can forward that information to the stadium so everyone knows, so some referees will get on the mic and explain why there is a delay. Q: The pace of football has increased a lot, more teams run uptempo/no-huddle and spread the field out sideline-to-sideline. From the official standpoint how difficult does that make your job? Well, you have to watch your area, you can’t watch the whole field. Everyone has an area of responsibility, if you watch the whole field you’ll miss something. You can’t just watch the ball either, you have to watch your area for what’s happening away from the ball too. Concentrate on your area designated to you, so the spread doesn’t change much for what we do. As for tempo, we make it a point to get the ball down and ready for play within 25-28 seconds left on the 40-second clock, sometimes it’s different depending on what happened on the previous play. Sometimes it actually helps us because players don’t have time to make a late hit or personal attacks because they have to hustle to get back on the line in time for the next play. We make sure we’re in a position to officiate once the ball is placed. It does add pressure though, we have to move to get a ball in quickly. As a sideline official we have to make sure the ball is brought into play, and we brief the ball people before the game that for teams that typically run fast offenses we need to really hustle to make sure we get the right ball in and it’s placed. We do the best we can, but sometimes things happen where we won’t get it placed as quickly as teams want. We caution ourselves though that we don’t want to place the ball down before everybody is in position. We do want to hurry up to accommodate the teams, but not to the point where we make a mistake or we’re not ready to officiate at the start of play. I have to make sure the line is set before a ball is snapped, so I want to make sure I’m in position, but we do what we can to keep the pace up for how teams want it. Q: What is your biggest fear from the perspective of an official? Making the wrong call that decides a game? Definitely making the wrong call that wins a game for one team. 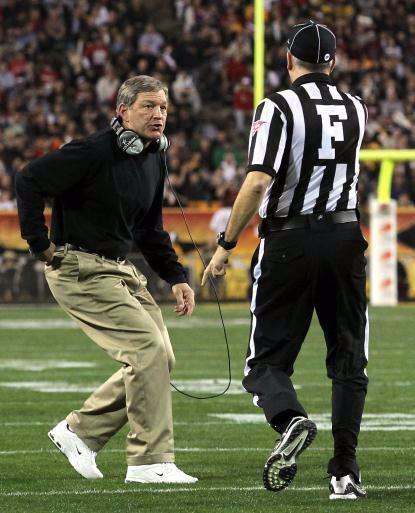 Or maybe I miss a call that should have been made that led to a touchdown and maybe it’s the difference in the game. As an official you don’t want your call/non-call being the game-winning call, I really don’t ever want that to happen. We need to make sure that it is the right call, that they look back on it on tape and confirm it. A coach may be mad at the time, but when they watch the tape maybe they’ll see that it was actually the right call. The worst is if we miss something or make a call we shouldn’t that ends up deciding a game. Q: What are the best things about being a referee? I enjoy the traveling and hanging out with my fellow referees eating dinner before and drinks afterwards, being around the same group of guys every weekend. During games, I think about how I’m out on the field at a game where there are hundreds of officials who would love to be in my position right now. It’s all about perspective; a guy told me long ago when I first started “there are no little games.” That’s important to remember. It may not always be nationally televised, but that game is important to all the players, fans, and coaches that worked all week preparing for this game. Q: What should fans know about the game of football, or the job that referees do? What should fans think about before automatically blaming refs for everything? What the fans don’t know is that football is governed by rules, sometimes officials don’t make the rules, sometimes we may not even like the rules, but the rules are the rules. It would be helpful if they kept that in mind, the officials don’t make the rules we’re just paid to enforce them. It would be helpful if fans knew what officials go through to get to this level. We work week-to-week and year-to-year to prepare for those games on Saturday afternoon. We don’t just show up that day and officiate the game, there’s a lot of preparation that takes place. Fans have to be really careful about blaming referees for a loss. We strive to not have an impact on the outcome of a game, we’re human and may make a mistake, but it’s also the coaches and players that may be making the mistakes out there too…rather than assuming it’s all our fault, what about #88 that dropped the pass in the endzone? We like to think that a team won or lost it because they deserved to, not because the officials had some impact in deciding it. There are times when it does happen where a call decides a game, but we try not to let it come down to that. We’re not responsible for your team’s win or loss, we’re just paid to administer the rules of the game so that no team is getting an advantage over the other because of the rules. WE DON’T CARE WHO WINS OR LOSES BECAUSE THAT’S NOT OUR JOB, we just want to make sure that the outcome occurs fairly whatever it may be. Officiating in general is not as easy as it looks. We have certain philosophies that we use, like bang-bang plays where we like to let the players play if it’s close. No matter what call we make during a game, somebody is going to hate it and somebody is going to love it. We’re never going to please everybody whether we are right or wrong. The officials don’t have a home field advantage, it’s always a road game for us, and nobody is ever very happy to see us come.